So Just How Big Is That New Iceberg? What happened: For the basics, see this New York Times graphic, complete with maps and explainers. Scientists had been watching the rift grow for years, and they spotted a dramatic 90-degree turn in May. No. 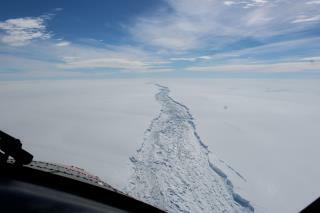 3: A video from Tech Insider says A68 (the name isn't official yet) could rank as the third-largest iceberg in history. It's 620 feet thick and covers 2,200 square miles. The video also explores why the crack began accelerating in 2014, once it broke through a protective "suture zone" of the ice shelf. Climate change? There's no scientific consensus on whether climate change is to blame because iceberg "calving" is a natural process in the Antarctic. But the debate is on: "For me, there is no doubt that this event is not part of a natural cycle," a NASA and UC-Irvine scientist tells the Washington Post. "We're not aware of any link to human-induced climate change," says a Swansea University glaciologist. Comparisons: Media outlets tried to make the size relatable to local readers, which is why we learned the iceberg is "about the size of Delaware" (NBC News), "twice the size of Luxembourg" (Guardian), "a quarter the size of Wales" (BBC), "roughly the size of ... the Indonesian island of Bali" (Reuters), "roughly four times the size of the city of London" (UPI), "deeper than the Eiffel Tower is tall" (USA Today), and has "twice the volume of Lake Erie" (the AP), and on and on. Shipping lanes: The iceberg isn't in commercial shipping lanes, but it could affect Antarctic cruise ships, reports Reuters. Sea levels: Scientists say these won't be affected because the iceberg was already floating, per Quartz. Where it's going: Ocean currents are likely to take the iceberg north, perhaps as far as the Falkland Islands, per Business Insider, which has accompanying maps. Eventually, those warmer waters in the north could spell its demise, however. The great lakes were formed from melting ice burgs way back before man and the industrial age. This stuff has been happening for ages and will continue. The only spectacle to see is the crazy loon liberals running around claiming the sky is falling. It is not the question of how big is that broken Ice Berg but how big is your country's contribution of the carbon pollution to the atmosphere and what big action your country has taken to reduce it?